It wasn’t a place on my ‘want to visit’ list; I had heard some really negative reports on Lanza-grotty; the windy isle; so when some good friends on the Island (Isle of Wight) told us that they went every November and to the same hotel year after year, Cockrobbinn and I were intrigued as our friends were very discerning people and we fancied a holiday in the sun before Christmas was upon us. As you’re only young once (hahaha – I’m nearer 70 than 60!!!) we booked ten days at the recommended hotel and were so pleased with it, that we plan to return for a fortnight next November. I’ve always said you shouldn’t judge a book by its cover, and how true this is. Mind you, there are parts of most holiday destinations that we wouldn’t choose to visit. If, like us, you want sun, sea, good food, good hotel and above all peace and quiet, don’t book in the centre of a noisy resort. What we hadn’t planned on was how hot it would be (almost 30°C all week) and absolutely no breeze at all. Two lagoon style swimming pools (one salt water) plus a whirlpool overlooking the sea and so beautifully quiet that quite often we were the only ones swimming although the hotel was almost full. Cannot wait to go back. Cockrobbinn showing off in the pool! Doing a pocket query on a 10 mile radius from our home location brings up caches way in excess of 1000. Similarly, the Isle of Wight (almost our second home) is home to around 250 Caches. I did a pocket query for Playa Blanca where we were staying and it showed up just 53 caches and some of these were over the water in Fuerteventura and Lobos. As there were a few near our hotel we were optimistic of finding some whilst away. However, we didn’t take into account our bad preparations, or perhaps I should say lack of preparations. I have only recently made some comments on how we don’t particularly prepare before going out geocaching; just spot some caches or perhaps a series and off we go and hope for the best. 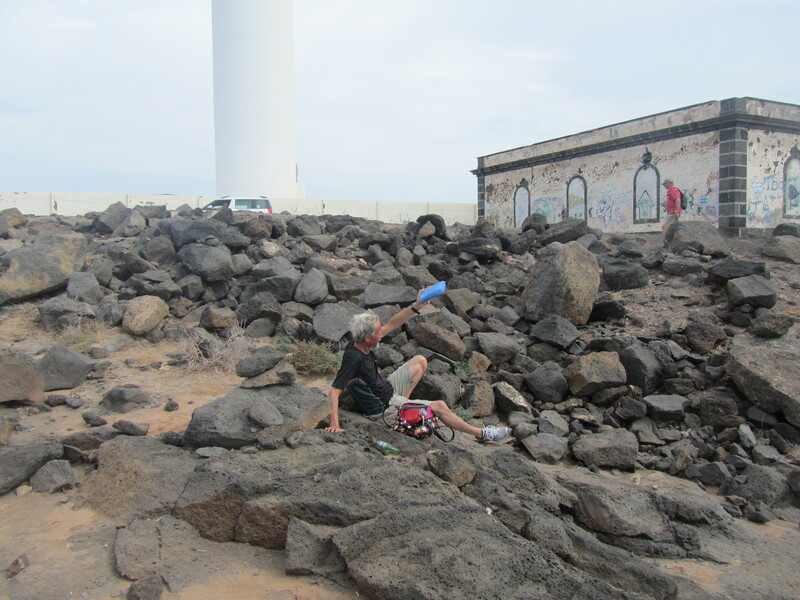 Up until now, this has worked well but we came to a very hot and sticky end in Lanzarote and really wished we had taken more time to check out some of the caches before attempting them. On the morning of our first full day on the Island, we decided to have a very quiet time and just chill out by the pool with the odd burst of energy resulting in swimming a few lengths (slowly) of the salt-water pool; refreshing ourselves with numerous bottles of water and delicious iced coffee delivered to us by the very obliging waiters. Absolute bliss. After a rather tasty lunch, I decided a stroll was in order and as there was a little paved promenade between our hotel and the beach AND a cache was only just over 800m away along this promenade, I persuaded Cockrobbinn that it would do us good to stretch our legs (I don’t think he was too keen but he came along). As I mentioned GC3AGA6 – U.L.I. was only a short walk away along a very quiet promenade which was between our hotel and the beach and our hotel had a keyed gateway on to the walk. So off we went; admiring the little sandy and rocky bays as we walked. 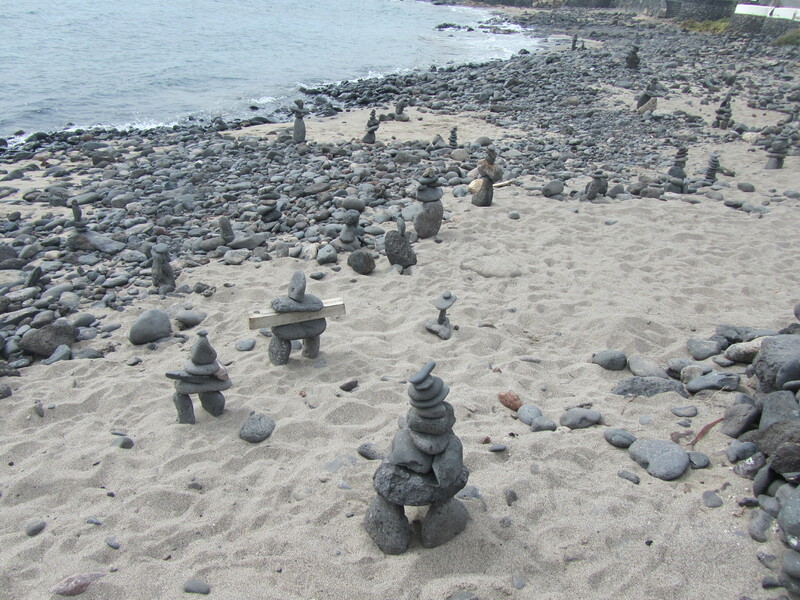 Being a volcanic island, nearly everything is made from lava rocks and as we approached ground zero we realized that the cache was hidden on the beach side of the wall of the promenade, where there was an outlet for the run-off from the mountain if it ever rained. I am not sure how long we spent searching every nook and cranny for the cache but I left Cockrobbinn poking in every hole with a stick whilst I went off to find a convenient hotel to answer a rather urgent call of nature!! Lanzarote is a very barren Island and there were no suitable bushes around!!! I then bumped into two people I had sat next to on the plane, and spent rather a long time chatting to them so when I eventually returned, I found a rather hot, stroppy Cockrobbinn cursing the sun, the heat, the difficulty of climbing over lava rocks on his own with still no sign of the cache. It was only then that I decided to check the activity on the cache on my iPhone and saw to my horror that the previous few logs were DNF’s. Why, oh why had I not looked at this before starting out. I don’t think Cockrobbinn was too pleased but he soon cheered up when we found a promenade-side café and refreshed ourselves with a cup of coffee. It may have been under a kilometer from our hotel, but boy was it a hot walk and we couldn’t wait to get back into the pool as there was absolutely no breeze coming off the sea and the clouds seemed to sit over the mountains and come nowhere near us. I love the sun and the heat but not too keen on it for walking. Lesson learned here – check activity on a cache before going !!!! 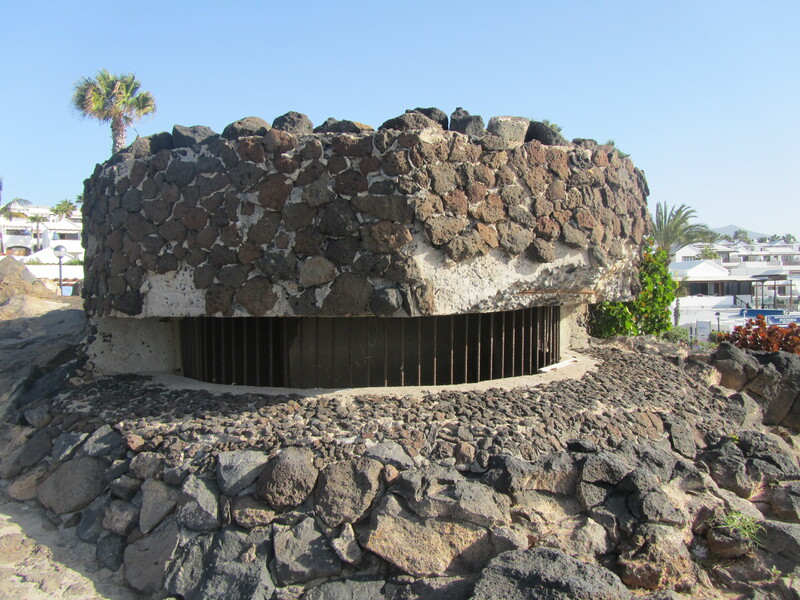 We saw these little buildings on many of the beaches on Lanzarote; they have probably got a name but we don’t know what it is. Our next ‘how not to find a cache’ event took place a couple of evenings later. It didn’t get dark until about 7 to 7.30pm and we were all poshed-up one evening quite early; I was wearing a lovely long dress and high heels and Cockrobbinn looked eminently eloquent in dark trousers and a white shirt. We could have dinner anytime up until 9.30pm at our hotel so we decided to have a short walk beforehand. I had previously noticed that there was a very local cache – not far from the entrance of the hotel and only about 380m away. What I didn’t take into account was that our hotel was situated at the bottom of a mountain volcano and the GPS took us up the lava flow. We reached the bottom slope quite easily but lava is not the easiest rock to climb over and most definitely not in high heels and a long dress. We soon gave up and promised to return at a later date suitably dressed. Again, in hindsight, had I read the previous activity, I would have known that it was a difficult climb as were the other caches on this particular mountain. 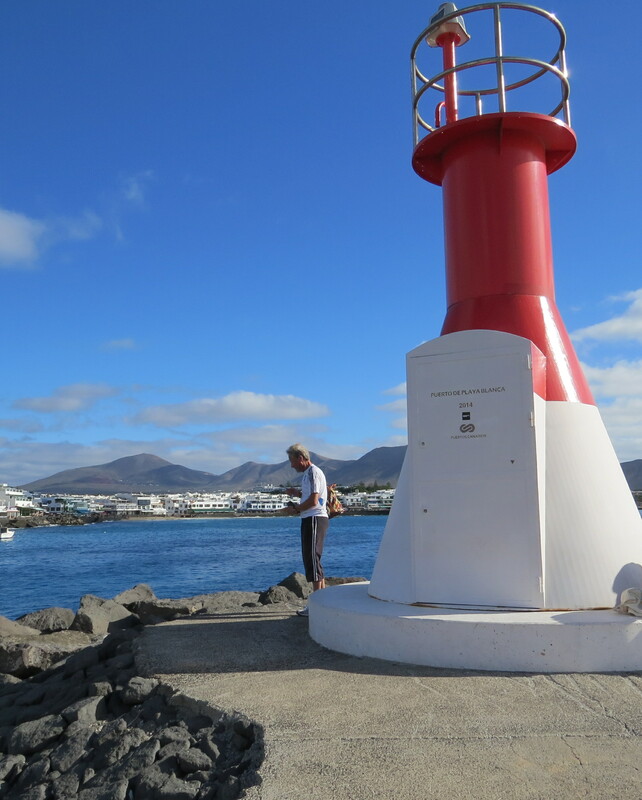 A few days later, we decided to visit the little town of Playa Blanca with its pretty harbour and there was a cache right at the end of the harbour wall/pier. Surely we could find that one. Third time lucky ? I would have thought that by now I had learned my lesson and checked the activity before attempting it? It was a lovely walk along the harbour, passing the huge ferry to/from Fuerterventura. At the end of the harbour wall was not a lighthouse as such, but some sort of navigation point. The GPS was telling us that the cache was about 12m further on which meant quite a dangerous scramble down the rocks towards the water. Cockrobbinn was willing to try but to be honest I didn’t feel like a visit to the local hospital should he slip and break an ankle, or worse. It looked decidedly difficult so I suggested we leave this one and so we walked around the harbour to find a café and yet more refreshment. We were sitting directly opposite the beacon, across the harbour, when we spotted two possible geocachers clambering down the rocks. I spent a while watching them through my camera lens and saw them give up after a few minutes. Unbelievably, had I read the activity on this cache, I would have realized that it hadn’t been found for quite a long time (there were about 8 DNFs logged) and shortly after our visit, it was disabled. We live and learn —- just wish I could learn a bit quicker !!!! After suitably refreshing ourselves, and having a look around the lovely little town, we decided to walk back to our hotel along the promenade which ran all along the coastline. There were two more caches on route – we were just hoping we could break our spell of bad luck bad preparation and find just one little cache. GC28Y95 Playa Blanca – El Jorge was actually hidden along the promenade so we were hoping we could find this fairly easily. Our signal took us straight to GZ and Cockrobbinn lithely hopped over the little wall and within a few minutes he proudly presented me with the container. Although there was a travel bug in the cache, we left it where it was as it wanted to travel to Rio and we weren’t going in that direction! It is surprising how finding a cache lifts the spirits and we determinedly marched along the promenade as there was one more on the way back. We reached GC3877F Gunners Nest in record time, considering how warm it was AND I had developed a blister on my toe as stupidly I was wearing beach shoes and not trainers. All along the coast are the remains of outlooks and this one was in quite good repair whilst others are falling into the sea. However, once there our GPS was all over the place even though we were out in the open. I checked the hint on the cache only to find it wouldn’t ‘open’ on my iPhone. Unbelievable !!!! We checked every nook and cranny around the ‘nest’ but eventually came to the realization that we were not going to find it that day. Hot, tired and frustrated, we headed back to our hotel for a cooling swim, determined to return the next day. Once we read the hint, we walked straight up to cache the following day making our total finds on the island TWO. I don’t really get annoyed or frustrated but this holiday has shown me that preparation is the key and I will probably start planning our expeditions with a little more care in future. To be fair, we didn’t plan on doing a lot of caching in Lanzarote as I have often said before, we are beach bums when the weather is good and we had really hit lucky in the weather stakes this time as it was even hotter than normal for the time of year. We had one more cache we wanted to try for and this time I checked out all the information I could before we headed out. U.L.I. 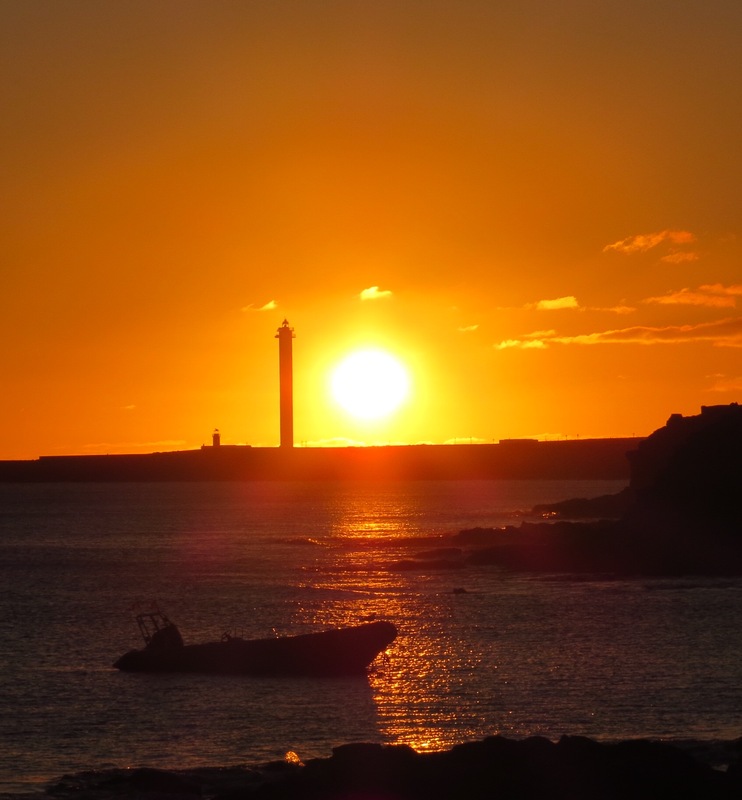 2 was a couple of kilometres along the promenade to the lighthouse Faro Pechiguera, and every evening, we could see the most beautiful sunset which occurred behind the lighthouse. We only had one day which was slightly overcast although very warm and so we decided to attempt this cache on that day. It was a very pleasant walk along the coastline and the promenade took us to within easy reach of the lighthouse. 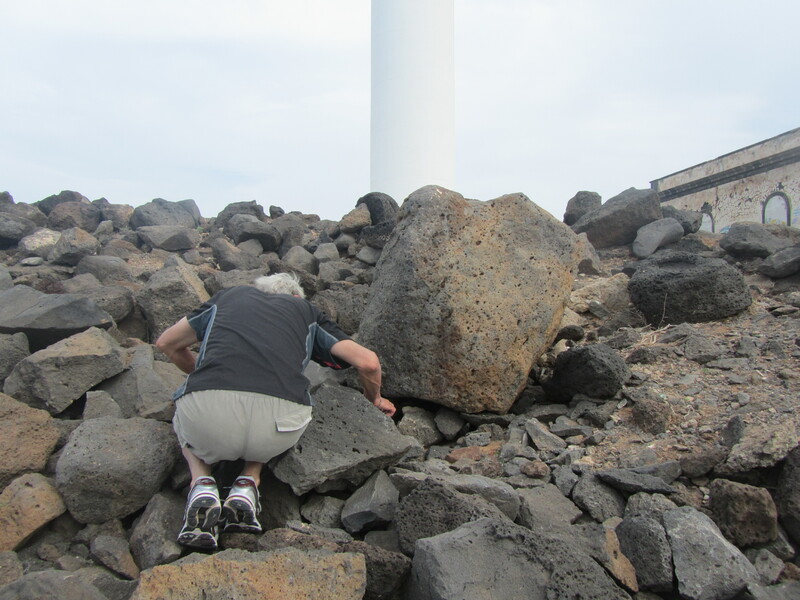 The cache was hidden among the lava rocks on the far side of the lighthouse and the hint (which thankfully I had looked at before we left the hotel) was a picture of a group of rocks. On reaching ground zero, I tried to check the picture hint but it was having none of it and wouldn’t open. One group of rocks looks awfully similar to the next group of rocks but eventually I spotted a clump which seemed familiar. As I wound my way down in front of the rocks I could see something blue hidden deep underneath one of the rocks. Cockrobbinn soon clambered up and cheerfully reached in and grabbed the container. I sometimes wonder whether he ever thinks that there might be something creepy and crawly, or even slithery lurking in the rocks but it doesn’t seem to worry him – but I bet he’d jump a mile if something touched his hand!! Hope there is nothing creepy or crawly in there! 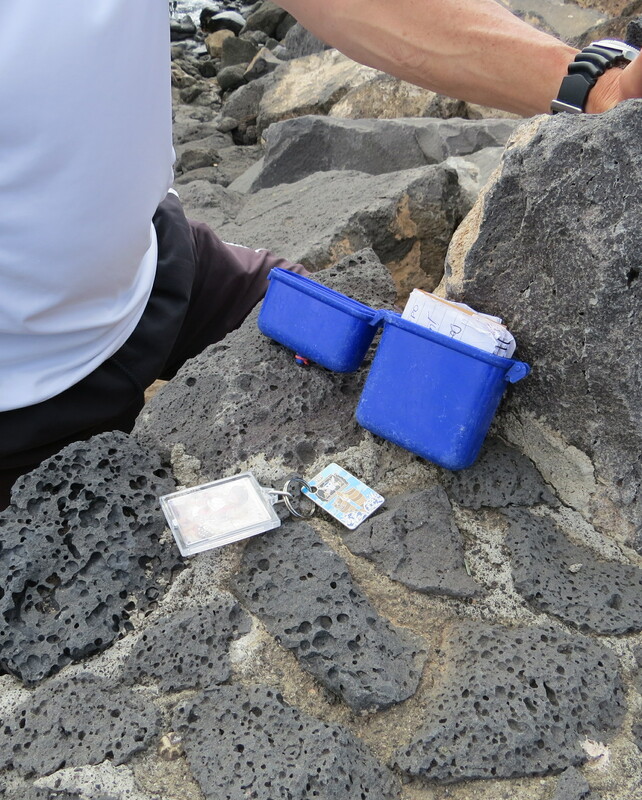 Our third and final cache on Lanzarote. We never did get around to climbing the volcano to find the ones in the cave and on the lava flow but as we loved the holiday so much we plan to return for a fortnight next November and will definitely go much better prepared. If nothing else, this caching experience has taught me to do my homework! This caching experience took place between 2nd and 12th November bringing our caching total up to 461. My BodRobbinn Travel Charger has now travelled 10459 miles. 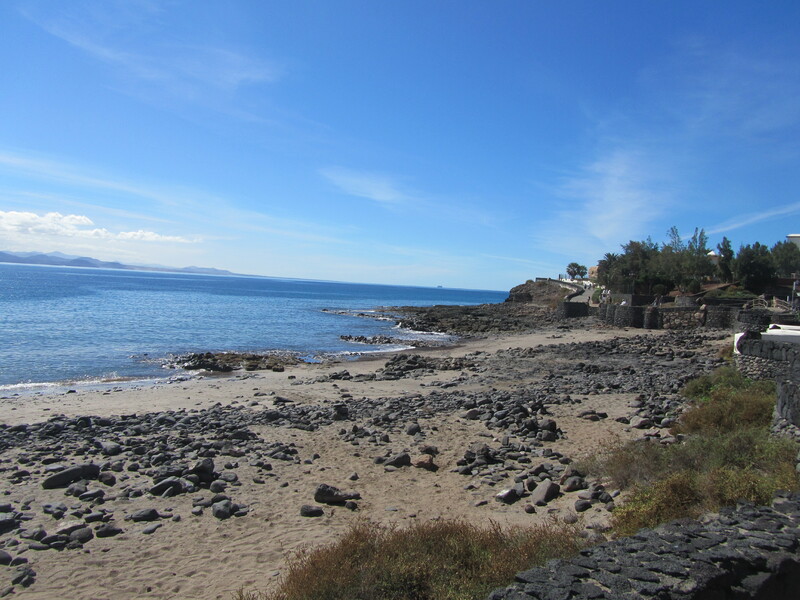 This entry was posted in DNFs, Geocaching, Lanzarote and tagged Caching, Geocaching, GPS, Lanzarote. Bookmark the permalink. 4 Responses to How NOT to go Geocaching………..
BOL we are always happy if we can find just one geocache! We are very organised, have to be because of the terrible phone signals and no 3G around here, so we have to download everything in advance. Then we get waylaid doing something else and it can be months before we get to go looking for those downloaded caches. If only the logs would automatically update we would have spent a lot less time looking for caches with DNFs… ha ha. Tho we did once find an archived cache that was still there complete with a log book. Mum & dad did a couple in Mallorca recently and trying to do caches when everything is written in a foreign language can be a bit challenging too. 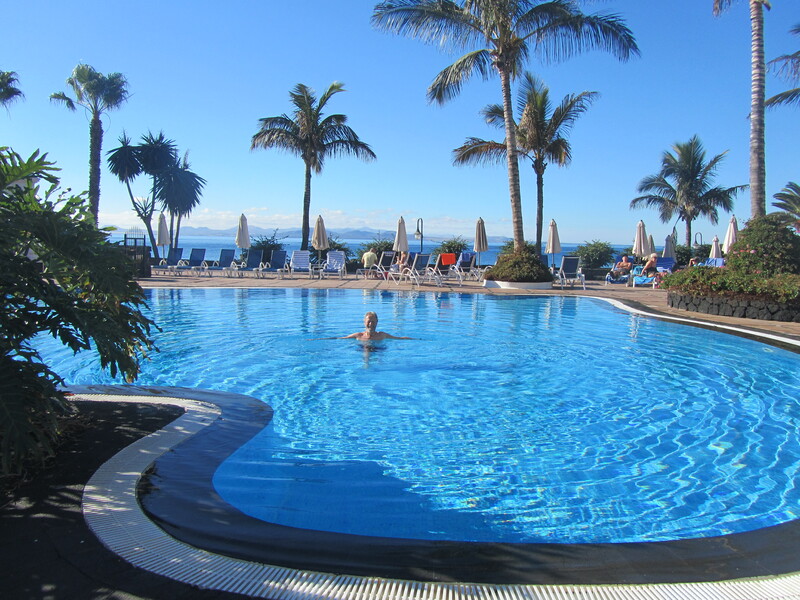 Thanks for showing us Lanzarote, I doubt that I’ll ever go but mum and dad might. I hope your mum and dad get there. I really must learn to be more organised but the enjoyment is still there, prepared or not! Phew, I was really starting to think that you would return without a single smiley. The place sounds absolutely gorgeous although I think Shar would not deal with that sort of heat! Makes me even more determined to be a Boy Scout now: Be Prepared !!! !